I have always been bigger than my peers from a young age. I hit puberty early and always assumed it was down to this but as I got older, I learned that I had a slower metabolism than most. I was wearing adult women clothing when I was a teenager and was always the biggest one in almost any group that I was a part of. I was the largest family member and biggest girl in my friendship group. By the age of 16, I was already wearing a UK dress size 16 (US 12). However, my weight really increased during the four years I was at university. I had difficulty making friends and often felt lonely. During this time, I found comfort in food. Eaten often and unhealthily, with little regard for what I was putting into my body. I was too shy to use the communal kitchens so I would often order takeaway of pizza and kebabs which I’d finish by myself in my room. 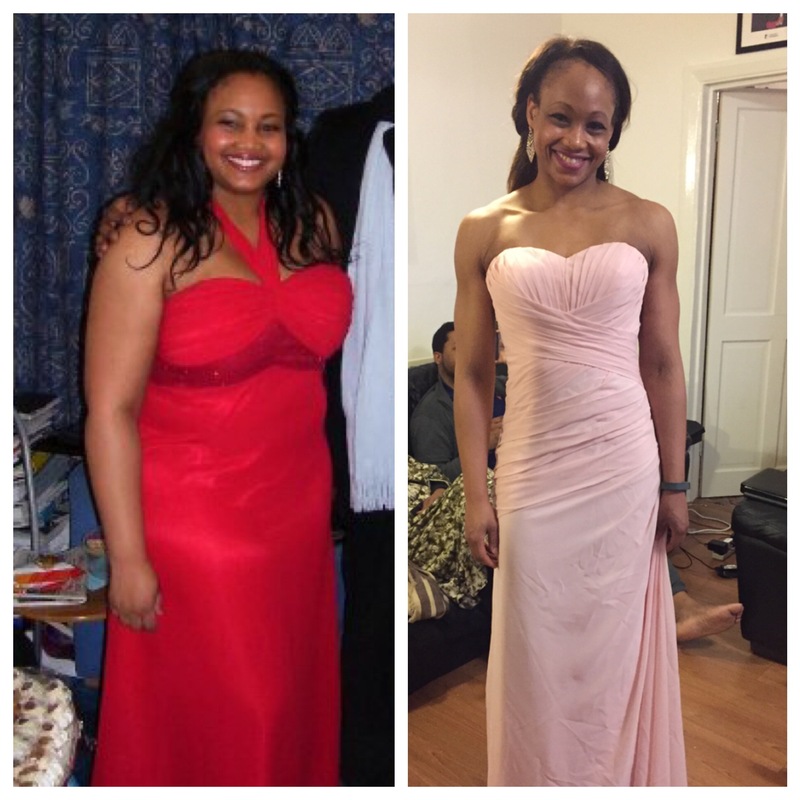 By the end of the four years, I had gone up 3 dress sizes and wore a UK size 22 (US 18) to my graduation. Over the next year, I put on a further dress size. I had a full time job which gave me more money to go out and eat dinner with friends. I would often eat 3 courses at a meal, and would have eaten throughout the day also. 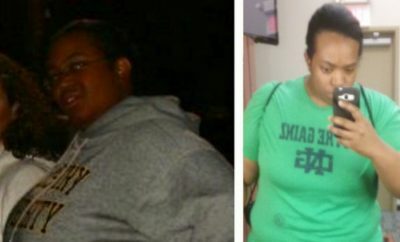 By the beginning of 2011, I was a UK dress size 22-24 (US 18-20) and weighed 266lbs. I joined a gym in 2010 but I wasn’t a very regular goer. My weight affected my confidence a great deal. I always loved my personality but felt the need to be extra friendly and nice to people to compensate for my body. I was often told that I had a pretty face but my body let me down. I would avoid going out to clubs or bars with my friends, who were all much smaller than me (UK size 10/US 8). I often felt like the ‘fat friend’ and worried that people invited me out so they would look better next to me. I hated taking photos and would never want to meet anyone new. I often went back to ex-boyfriends because the fear of trying to find someone new was too much for me. Although I didn’t realise just how big I had gotten, I knew I was usually the biggest person in most rooms. I remember going out for a birthday meal and almost crying when the waitress asked me to stand up on a chair so they could sing happy birthday to me. I was terrified that the chair would break under my weight and was worried about what other patrons would say. I heard one table comment that I did not look 22 years old and I was mortified. My weight made me want to hide in the background. In 2011, I started a new job that required more formal attire. I went shopping with my friend, who kindly picked up numerous UK size 16 (US 12) for me to try on but I knew I was bigger than that so I pretended I didn’t find anything I’d like. We were out for hours and I remember feeling so embarrassed about not wanting to try on any clothes, or not being able to buy something that didn’t go up to my size. My friend was so patient with me and that made me feel even worse. When I went home, I went online and ordered some clothes from Dorothy Perkins in UK size 22 (US 18). When they arrived, I couldn’t get the trousers over my bottom. Realising I had allowed myself to become a size 24, I decided to start calorie counting and trying to lose weight. 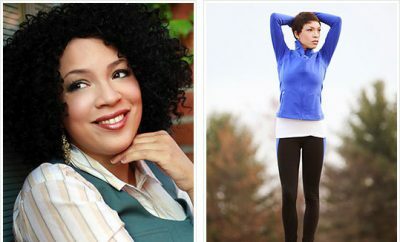 Throughout my life, I had received negative comments about my weight. Often being told that I had a pretty face but my body could do work. I tried to ignore it and didn’t want to lose weight because of what anyone said. Seeing that my clothes could no longer fit me and not wanting to wear a dress size that matched my age, I was shocked into doing something about my weight. I decided to weigh myself and found out that I was 19 stone (120kg/266lbs). At 5 ft 6, this gave me a BMI of 42 which was morbidly obese. I had previously tried to do weight watchers and Slim Fast in the past but had been unsuccessful. Both I understood that both of them worked because of limiting calories so I decided that I would start calorie counting. I also made a conscious effort to go to the gym 3-4 times a week. I calorie counted successfully for two weeks, losing 7lbs (3kg). I met up with a friend for dinner and she told me about a diet she would be trying herself, called the Cambridge Weight Plan. It was a ketogenic diet hat worked by putting your body into starvation mode and causing it to convert existing fat into energy. I contacted a nearby consultant the same night and arranged to see her in two days time. The day before starting the diet, I decided to do a liquid only diet to see if I could handle cutting my calories and intake so much. I had two smoothies and one soup all day long and then decided to go ahead with my appointment the following day. After meeting with the consultant, I purchased enough food products to keep me going for the week and thought I would at least try for a few weeks, if only to kick start my loss. In the first week of the Cambridge diet, I lost 6lbs. The following week, I’d lost another 5lbs. I set myself a target weight of 10 stone (57kg/126lbs) and I would lose between 2-5lbs a week on this diet. It was a very difficult diet to do. You could only consume their products (as any other food would kick you out of ‘ketosis’) and couldn’t drink anything other than water, tea or coffee with no milk or sugar. It was quite antisocial because you couldn’t go for meals or drinks with people but the numbers every week were bigger than any other diet would give me so it spurred me on to continue. I carried on with going to the gym but couldn’t do anything too high impact because of the low calorie intake. I would aim to burn 300-400 calories each session, going 3-4 times a week. I would use the step machine, bike and treadmill. Within 10 months, I was down 9 stone (57kg/126lbs). The most difficult part of the Cambridge Diet was being unable to deviate from it in any way. During this time, I became aware of how many social events revolved around food. I felt very isolated as I was unable to go out for meals or drinks with people. I was happy to attend but people felt uncomfortable if I wasn’t consuming food/drink so I avoided it to prevent them feeling awkward. I found that people would also try to sabotage my efforts, often pressuring me to eat or drink something I didn’t want to. Some friends also changed towards me and stopped inviting me out once the weight loss became evident. It was more challenging coming off the diet and reintroducing ‘normal’ food. I struggle to cope with this and often felt guilty eating regular food like porridge. I had also developed an obsession with the weighing scales and would weigh myself multiple times a day, every day. I found it hard to have an every day relationship with food because the plan gave you set products to eat and in many ways felt safe. I started to develop an eating disorder following the diet. I often felt like giving up during the diet. Although my numbers seemed high, they were much lower than the average person who did the diet. My friend was doing it alongside me and she often go double the numbers that I would get. It felt very frustating, especially since the diet was so restrictive. However, I knew that ketosis was the most effective way to lose weight quickly and given that I had so much to lose, I stuck with it. I was also doing the diet with my friend who had told me about it, so I had support from someone who was living the exact difficulties that I was experiencing. It really helped having a buddy who knew the struggles of the diet. We would text each other constantly and that was great at keeping me motivated. We also planned a holiday for the same year which gave us something to look forward to and to work towards. 7 months into the diet, we went to Morocco and I wore a bikini for the first time in my life. Even though I was 14lbs out from my goal weight, I still looked and felt the best I had ever been. The holiday coincided with a break from the diet, as NICE guidelines state that you can only follow a ketogenic diet for 12 weeks before you have to have a 1 week break and then start again. I did have some weight loss plateaus, especially towards the end of the diet when I was nearing my target weight. However I stuck with the diet and continue to push through, believing that my body would eventually have to respond to what I was doing. I also increased my exercise times and intensity in the gym to give my body an extra shock and a kick start. I lost the bulk of my weight within 10 months. However, by 2015, my weight had started to creep up again and I was a UK dress size 14 (US 10). I then had to work really hard to lose the weight again, through a low carb approach to food and intensified exercise. I was back down to a UK dress size 8-10 (US 4-6) within 5 months. During my recent weight loss attempt, I did not weigh myself at all or follow any formal diet plan. And I was able to lose 3 dress sizes in a relatively short space of time. I also developed a level of strength and muscle definition that I have never had before. I look leaner than I did when I first lost weight in 2011, and most of the clothes I bought at the end of the diet are too big for me now. I also got a promotion at work. My daily diet is mainly protein and vegetables. I tend to eat fish, chicken or turkey on a daily basis with lots of vegetables and salad. If I want to have a snack, I will eat rice cakes or corn thins, nuts or fruits. If I feel like having something ‘naughty’ I’ll opt for frozen yoghurt or a weight watchers low calorie/low fat snack range. I also still track my macronutrients and calories using Myfitnesspal. When I was heavier, I ate what I wanted without any regard for the calorie or fat content. I would often start my day with a bacon sandwich or some sort of bagel. Lunch would be another sandwich, pasta or chips. Dinner was often takeaway, three course restaurant meal or some sort of pasta dish loaded with cheese. I would often have a dessert like chocolate or ice cream. I could eat a tub of Haagen Daaz or Ben & Jerry’s to myself in one sitting. I make sure that I work out every single day. I do a minimum of 1 hour cardio on a daily basis now. I like to do plyometric or high intensity interval training featuring moves like jumping lunges, squat jumps and burpees. I go to the gym 4 days a week and do 2-3 classes each time. I started going to work earlier so I could walk instead of catching the bus. When I was heavier, I did try to do some exercise but never more than 1 hour. I struggled to jog or run and had to take numerous rests when I was attending a class. I would drive or catch public transport wherever I could and generally avoided walking as much as possible. Do it for you!If you try to lose weight for an event or because someone else tells you to, there is a big chance that you won’t suceed. For years, people would comment on my weight and it had the opposite effect on me. 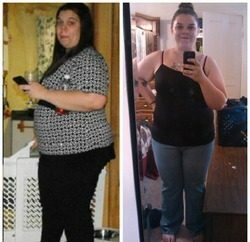 I was determined not to lose weight for them because 1) I didn’t want them to change me and 2) I didn’t want them to take credit when I did lose weight. By the time I lost weight, everyone in my life had written me off and believed that I would always be a heavy girl.When I lost weight I decided to do it because I wanted to. I set my own target weight and dress size and choose my own method for losing weight and it worked. Even now, when my weight fluctuates, I make changes based on how I feel and how I see myself. Aim for fat loss rather than weight loss. Although weight is a good indicator of the state of things, it can be affected by so many things. As a woman, it is affected by your monthly cycle. It can also be affected by muscle gain.Try not to get hung up on the numbers. Find other ways to measure your progress like measuring yourself or doing a body fat percentage check. These are often more accurate and that’s what you should be aiming towards. Two people can weigh the exact same amount but if one is 50% body fat and the other is 12%, they will look completely different. Remember, muscle takes up much less space than fat does, even if it weighs the same! Exercise! !Whether you do cardio, strength training or both, make sure you’re getting regular exercise in your life. Not only is it great for the body, it’s amazing for the mind. Exercise can be therapeutic and also gives you a sense of achievement and accomplishment once you’re done. It helps give you focus, all whilst making your heart and body healthy! If you don’t like gyms, find other ways like walking or running outside or working out at home. There are so many different ways to get your heart racing that there will be something for everyone. Educate yourself when it comes to food. Although calorie counting can be tedious or become an obsession, doing it for a short while will help you to understand what you’re putting into your body. I would recommend the app Myfitnesspal. It allows you to input your food as well as your exercise, and shows your macronutrients. Its an easy way to track your carb, fat and protein intake as well as monitoring your calories. When you see just how much exercise it takes to burn off a slice of cake, you will much prefer to eat a huge bowl of chicken salad.Myfitnesspal has made a huge difference to my life and I highly recommend this app or something similar to help you start being healthy. Love yourself!Don’t lose weight or exercise as a punishment. Do it because you want to better yourself. But before you do it, you should really try to learn to love yourself. If you only like yourself when you’re smaller, you’ll have difficulties because your weight and your size will always fluctuate. Don’t put your value or self worth on your aesthetics because they are incredible changeable. 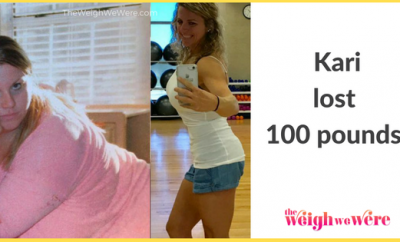 Lose weight because you love yourself enough to want to be healthier and live longer.